As the first model in a line of LifeSpan treadmills, the LifeSpan TR 1200i folding treadmill is still one of the more popular treadmills available. Released in May of 2010, the 1200i is equipped with a myriad of fitness features that help to aid in any type of workout. 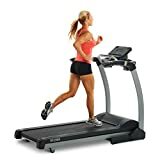 This 2.5 horsepower treadmill is priced at $999.00 on Amazon.com and includes an LCD display that tracks a large number of workout variables. Consumers will find that one of the primary features is that of the folding capability of the treadmill, wherein users can fold it and store it practically anywhere. The entirety of the treadmill measures at 33 x 54 x 70 inches, with a running surface of 20 by 56 inches. Consumers will have access to 17 preloaded workout apps that focus on a number of different strategies, including weight loss, general health improvement and sports training. Similar to its more expensive counterparts, it also includes 2 heart rate and 2 customizable programs. One of the more unique apps available to users is that of the MyZone Interval program, which allows the user to input a minimum and maximum heart rate that they want to stay at during the workout, allowing the treadmill to adjust the incline and speed should the need arise. The 2.5 HP drive motor is very quiet compared to many competitive treadmills. There are many times where a user’s own footsteps will be louder than that of the motor, which is a welcome addition. If the user reads the instructions correctly, assembly of the treadmill is very easy and can be done in under an hour. However, there is a small possibility that users may need almost double that time to assemble in certain cases, but this is unlikely. The surprisingly advanced LCD display system tracks nearly everything that the user could think of, including calories burnt, speed and distance ran. The treadmill also comes with what is known as Intelli-Step technology that allows the machine to record the amount of steps that are taken on the treadmill by noting every time that a user’s foot strikes the belt. The treadmill comes with a useful system that identifies when the user has stopped running on the treadmill and pauses the machine automatically. If the user’s foot does not hit the running surface for a period of 20 seconds, the pause mechanic will activate accordingly. During assembly of the treadmill, it is possible to run into a problem wherein one of the screws will not fit properly where it is supposed to go. This can be remedied by using a hammer, but is something that should have been easily avoidable. Though the 20 by 56 inch running surface is rather large, many of its competitors have larger surfaces that can better accommodate any type of runner. The treadmill does not come with belt lubricant, while many similar treadmills do. Belt lubricant is important due to its ability to keep a treadmill properly maintained and in good condition. 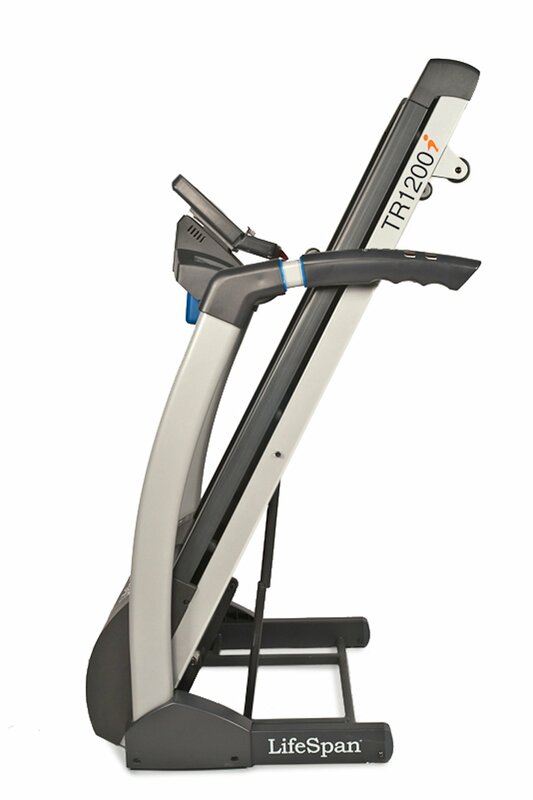 The LifeSpan TR 1200i is a feature intensive treadmill that goes well with any type of workout. A wealth of accessories are included with the treadmill, making it a great buy at the cost of $999.00. The treadmill itself can hold up to 300 pounds, while the folding system is a huge space saver. While there are better machines out there, such as the Yowza Fitness Daytona Treadmill, it, as well as others similar to it, is much more expensive than the 1200i. Even its counterparts, the 1300i, 1400i and 1500i are all much more expensive for basically the same amount of features. What prospective buyers should consider the most are the features, and on that front the good far outweighs the bad in everything the product has to offer.